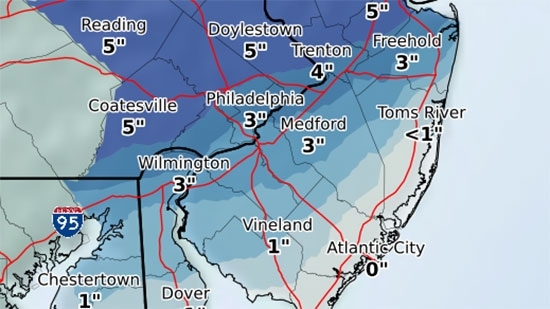 A tricky, thread-the-needle winter storm is expected to affect the Philadelphia area this evening and overnight with the possibility of accumulating snow. Sunny skies early will give way to clouds as the afternoon progresses. A cold front passed through last night bringing in enough cold enough air that a storm approaching from the south later today should produce wintry precipitation. It is perfect timing. Precipitation will start in the late afternoon and early evening. It is expected to clear out in the early AM hours. Areas far south and east will get only rain. Philadelphia and the I-95 corridor could see 1-3 inches, while 3-5 inches is expected north and west. It will already begin to warm back up on Sunday with sunshine and a high of 48. Look for 70s mid week! 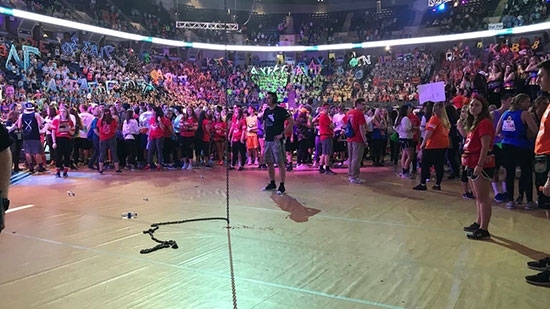 A female student was injured last night when a chain fell from the ceiling of the Bryce Jordan Center at Penn State University. The student was participating as a dancer in THON, the 46 hour dance marathon/fundraiser for pediatric cancer. It happened just after 11 p.m. She was struck in the head near the eye. No word on her condition, but she was able to walk away. Pictures show one end of the chain on the floor and the rest running up into the ceiling of the arena (see photo below). THON started at 6 p.m. Friday and ends at 4 p.m. Sunday. For more on THON and to watch the live stream go here. "A student dancer was injured. THON is working closely with the Bryce Jordan Center staff professionals to evaluate the situation and ensure the highest level of safety for all attendees. This will continue to remain a priority for the duration of the weekend." A 5-year-old boy was hospitalized on Friday night after he was accidentally stabbed by his 10-year-old brother. It happened after 8:30 p.m. on the 1200 block of S. Ruby Street in the Kingsessing neighborhood. The older boy was playing with a carving knife. His younger brother was stabbed once in the chest. He was taken to Children’s Hospital of Philadelphia in stable condition.